Płytka zawiera najnowszy model ESP8266 ESP-201. UWAGA NA OBRAZKU JEST ODWROTNIE PODŁĄCZONY DHT11. For the board to boot correctly into application mode, it looks like the DIP switch ‘R’ has to be On, which pulls pin IO15 high. To enter reprogramming mode to reflash the ESP, K2 must be On or switch S2 can be pushed. 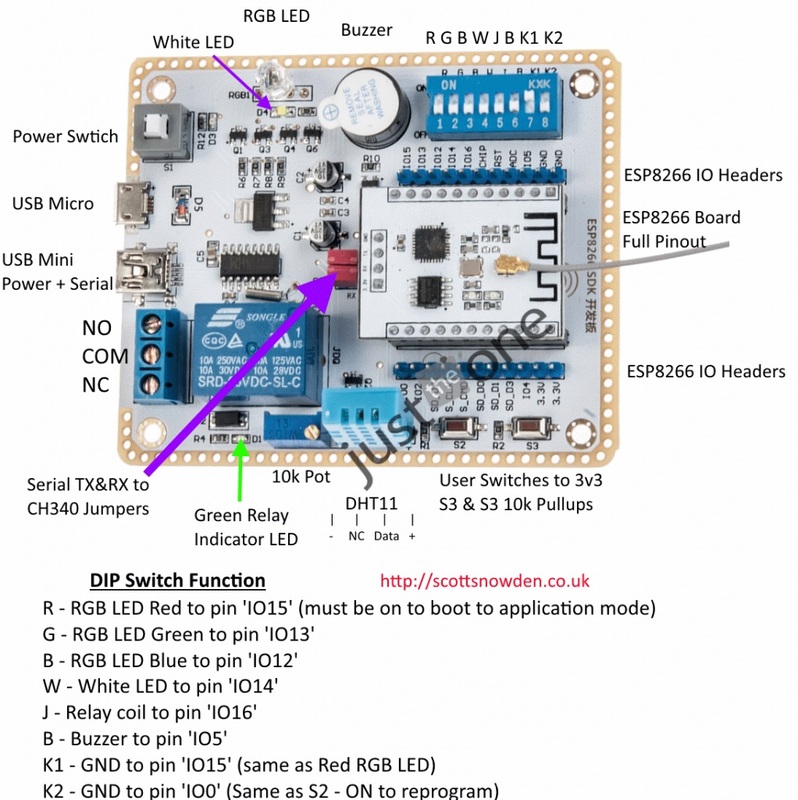 By default (at least in the firmware that came with the board and the latest NodeMCU firmware) most of the pins are configured as inputs, which causes them to float or be pulled high and so with the DIP switches ON the RGB LED elements are all lit, the white LED will light, and the Relay and green indicator will be on. IO5 does not have this behaviour so the buzzer is off by default. Na Win 8.1 Pro chodzą te sterowniki. Strona wygenerowana w 0.049 sekund z 20 zapytaniami.